LOCALLY, the Neighbors in Christ Parish kicked off their efforts to raise awareness and funds for Imagine No Malaria in May 2011. Since that time we have raised over $1600 which is like saving 160 lives! People have been given coin collection cans to save the change they bring home at the end of a day. These cans have a pop open bottom which can be removed and then put back making the cans reusable. We have also encouraged people to Save 100, asking them to give $1,000 over the three years to save 100 lives. We will soon have plans in place for another big event for late spring or summer to raise more funds for this effort which extends the healing power of Christ to those who do not have the knowledge or resources to heal themselves without help. When this campaign ends, countless live will have been saved and the knowledge will be in place to help communities remain from the killing power of malaria. DONATE in your Sunday offering or you can donate through the Imagine No Malaria website or by texting 27722. To read more about this healing ministry of The United Methodist Church go to www.imaginenomalaria.org. This is an appalling statistic in a world where six of the seven continents have very few cases of malaria and almost no deaths caused by the disease. That leaves the continent of Africa to bear 91% of the burden of lost lives, lost income and lost opportunities to build the economies in each of the countries affected. 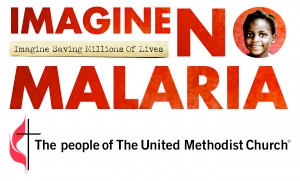 The United Methodist Church as a WORLDWIDE denomination is working with partner groups in a campaign to end death by malaria on the continent of Africa by 2015. This campaign is called Imagine No Malaria. In partnership with groups like the Bill and Melinda Gates Foundation, The World Health Organization, The United Nations Foundation, The Global Fund, the Red Cross/Red Crescent and the work of scientists around the world this is an attainable goal. There are several areas of work in this campaign. First is prevention through the distribution of bed nets and teaching people to use them effectively. Second is to treat people by equipping existing hospitals and community health workers with medicines to treat those infected by malaria. Then comes the education of people in rural areas on steps they can take to protect themselves from mosquitoes by trimming foliage and emptying areas of stagnant water. Finally, on a continent that doesn’t rely on newspapers, there is an effort to deploy radios, cell phones and citizen communicators to spread life-saving information. What can WE do? & What are WE doing? What is the United Methodist Church doing?